Pep Angles & Toni Ferrer headed up an all-PGA of Spain top-three at 2019 PGAs of Europe Fourball Championship Presented By Costa Daurada after earning the Championship honours with a closing 64 at Lumine Mediterránea Beach & Golf Community in Spain. After starting the final round one shot ahead, Angles & Ferrer executed their steady strategy as planned, securing the title with a seven-under final round on the Lakes Course, for a -24 total (190). “It was great to come back here and get the victory with my partner, It was amazing. Pep played some really good golf…and the final was great,” said Ferrer. Second place fell to one half of the 2018 Champions, Xavi Puig Giner, and 2018 Costa Daurada International Pro-Am Champion, Emilio Cuartero Blanco. Playing in the penultimate group, the PGA of Spain Members were able to keep a close eye on the leaders throughout the day, however even their 64 was only enough to match the eventual winners, keeping them three shots from the pace at -21 (193). 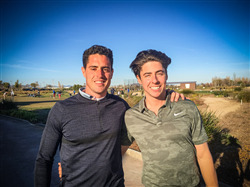 Another pair of Fourball Championship regulars, Jordan Gibb & Liam Murray (PGA of Spain), repeated their 2018 finish claiming outright third position with a final 65 (-6) and a -20 total (194).